Lantec, Louisville, KY, proved the perfect machine for the job. Adding the machine to its packaging operations sliced Ranch Hands’ damaged-product returns in half, while reducing annual labor costs related to purchasing by nearly $19,000 and packaging costs a total of $25,000 per year. The story begins in January 2006, when the company installed a new robotic powder-coating line that created a bottleneck in packaging, according to Greg Chumchal, Ranch Hand general manager. “We were hand packaging everything and even with six people working the packaging line, we couldn’t keep up,” Chumchal says. Grille guards are large and oblong, and weigh an average of 130 lb. ; front bumper replacements have similar dimensions and average 270 lb. Both products proved challenging to wrap—the firm was using foam-in-place pads overwrapped with two large kraft sheets laminated with a spun-wound polypropylene liner. Kraft wrapping was held in place with hand-tied bailing twine. The firm’s new packaging strategy uses scored corrugated sheets to hold the foam pads in place, followed by stretch wrapping with the Lan-ringer—an overwrap machine designed to wrap product that moves through the production process on a conveyor. The film-delivery system mounts on a 40-, 60-, 75- or 90-in. ring through which the product passes, and Lantech’s patented Power-Thru conveyor enables wrapping the product and conveyor simultaneously. The conveyor supports the product through the wrap zone, allowing the stretch film to be applied with the proper containment force. 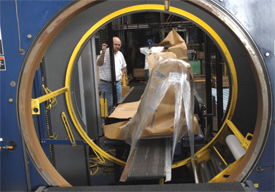 With wrapping completed, a cut-and-clamp device cuts the end of the film and the stretch film recovers against the product as it exits the machine. Wrapping parameters, including conveyor speed and number of wraps, are adjustable from the machine’s controller, allowing loads of random length, width or height to be wrapped on one machine. “The versatility of the machine allows us to handle almost any shape or size we put through it—we wrap 95 percent of our products with it,” Chumchal says. The firm credits the machine with reducing packaging costs related to labor by nearly 17 percent and materials by 12 percent.